Once you have found survey data that you would like to further explore, you can perform a number of analyses on that data in the Nesstar repository, including frequencies, cross-tabulations, correlation, and regression. You can also download the full dataset, or a subset of that data, for further analysis in a statistical software package. For more information about statistical software, check out our link on the left side of the page. When viewing data in Nesstar, you can click on the variable name in the left menu in order to view the frequencies for that variable. The frequency (f) of the value of a variable refers to the number of times the observation of that value occurs in the data. In the following example, the variable is “Legal Marital Status”, and the frequency for “Divorced” is 55,848, and represents 6.6% of the total valid responses. 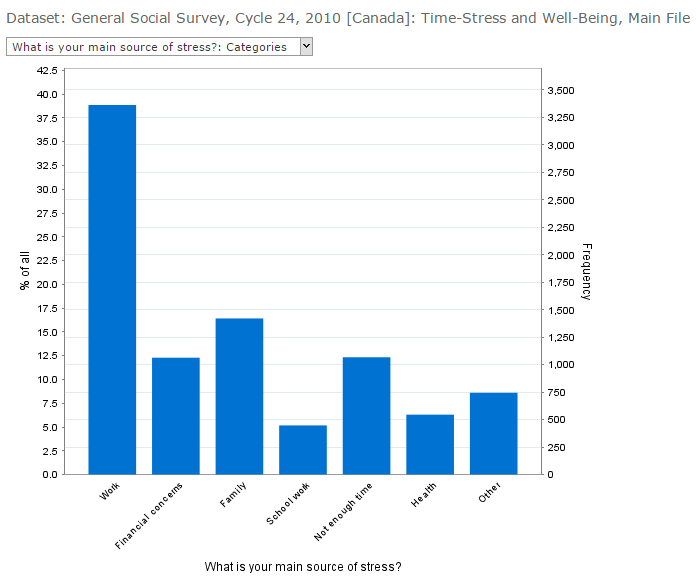 Unweighted frequencies (N) are the number of actual respondents. Weighted frequencies (NW) represent the number of responses and frequency adjusted so that the sample size more accurately reflects the general population. Nesstar also provides summary statistics for certain types of data, including mean, minimum, maximum, and standard deviation, that are useful for univariate statistical analysis. This information will appear below the frequencies. We recommend verifying frequencies in the official codebook, which you can find under ‘Metadata’ in ‘Other Documentation’ if there is one available, in case of any discrepancies. By default, when a data set has only one option for the weight variable, the variables are weighted when viewing frequencies under the ‘Description’ tab. When creating cross-tabulations and analyses for a dataset that has multiple weight variable options, you will need to weight the data. To add weights, select the scale icon in the upper right corner of Nesstar. You will see a reminder that the weight is on below the cross-tabulation or analysis. To find out more, see Nesstar’s Exploring Data page. Add to row & Add to column: Adds the variable to the horizontal rows or vertical columns for the cross-tabulation. To remove a variable from the cross-tabulation, click on the variable’s drop-down menu above the table and select “Remove from table”. If more than one variable is added to a column or row, they will appear as nested. Use as filter: This option allows you to display only one value of a variable at a time, such as only the male respondents for a survey. Clicking this option will make a drop-down menu appear above your table, where you can select which value of that variable you would like to filter by. Add as measure: With this option, you can add a continuous variable (e.g. age, height) to the table as a measure. If a variable is added as a measure, the numbers in the frequency cells will represent the selected calculation from the drop-down menu for the measured variable in that category. In the following example, the number of average insurable hours is used as the measure; so, the average number of insurable hours for university graduates that made a claim in the last 12 months in 2012 is 1,761.1. You can further customize your table by using the drop-down menus for each variable in your tabulation. From these menus, you can customize what data appears in your table, move data between rows and columns, remove variables, or insert calculations from the data into your table. Tables created in Nesstar can be quickly exported into a spreadsheet by clicking the icon to export a table in the upper right corner. This will download a .xls file to your machine. To find out more, see Nesstar’s Creating Tables page, and Nesstar’s Manipulate Tables page. 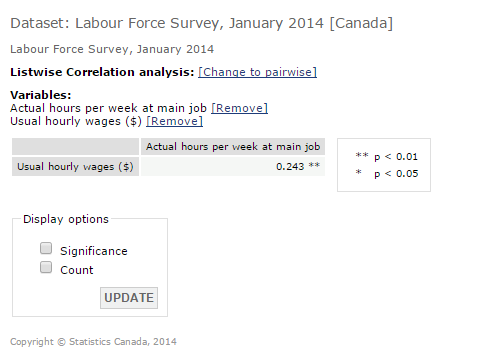 To perform a correlation in Nesstar, click on the “Analysis” tab, followed by the “Correlation” tab. You can then add variables to your correlation by clicking the variable name in the left menu, and then clicking “Add to correlation”. In this example, we have found a correlation of 0.243 for hourly wages and hours per week at job, and it is significant at the 0.01 level. To view the significance or count of the variables, you can use the display options below your results. 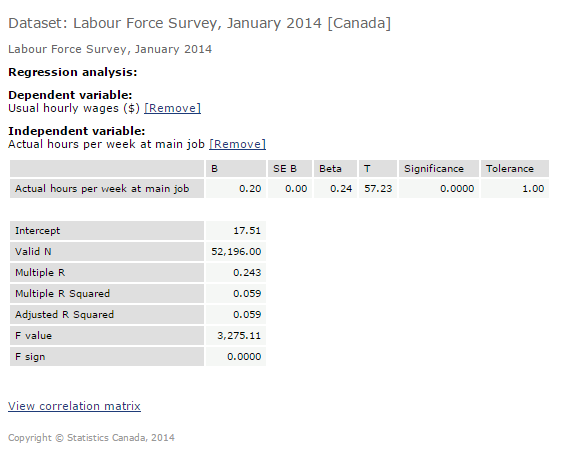 To perform a regression analysis in Nesstar, click on the “Analysis” tab, followed by the “Regression” tab. You can then add variables to your regression by clicking the variable name in the left menu, and then clicking “Add as independent variable” or “Add as dependent variable”. You must add one of each kind of variable. Once you have selected your variables, you will see an output table for regression values. In <odesi>, you can either download the full dataset or select a subset of that data to download. When you click the “Download” icon in the upper right corner, you can select the format that you would like to received the data in. You can then select your file type and click “Download” to download the full dataset, or click “Subset” to select what parts of the data you would like to download. Selecting Subset will bring you to a new page. You will then need to click on the variables on the left that you would like to have included in your data download, and click “Add to subset”. Once you have selected all of the variables you would like included in your download, click “OK”. You can create a subset based on specific cases in the dataset. For example, we might only want to download data from a specific age group. To create a filter or to subset cases, click the filter icon in the upper right menu bar. Then, click on the variable in the left menu and select “Add to subset”. Select the value and category from the “Categories” list, and click “Add”. You can use the operators to select more than one category (e.g. age < category 6, ages 27 to 29), and click “OK”. To add multiple categories individually to your subset, you can select multiple cases by holding control or command and selecting categories, and then click “ADD”. To add multiple variables and cases to the subset click “More” and click on the variable from the left menu and select “Add to subset” . Once you have selected the parameters of your data download, select the format that you would like to export the data into, and click “Download”. 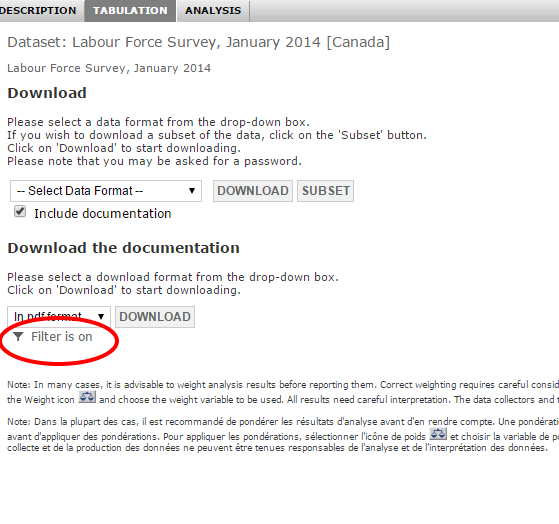 If you have selected a subset of the data, Nesstar will remind you with a notification that the Filter is on. 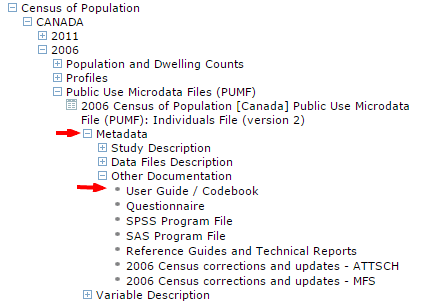 With your data download, you can also select if you would like to download the documentation for this data. 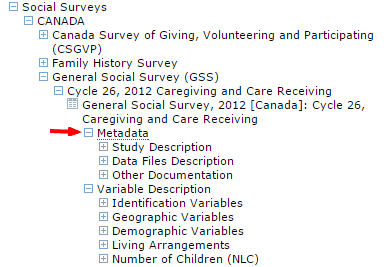 As this documentation is generated by Nesstar, we recommend downloading the original documentation for the data set by clicking on “Metadata” on the left menu, underneath your survey. To find out more, see Nesstar’s Download Data page, and Nesstar’s Subset Data page. In Nesstar, you can create various kinds of visualizations for your data, including bar graphs, pie charts, and scatter plots. Visualization options available will change depending on the kind of data you are using in your analysis. For cross-tabulations, you can create horizontal bar charts, vertical bar charts, or pie charts. To create a chart from a cross-tabulation, create your cross-tabulation from the previous instructions. If you would like a graphic for a single variable, then add only one variable to the tabulation. Once you have the variables you would like in the graphic added to your cross-tabulation, click the “Barchart” icon in the upper right corner. Then, select the type of graphic you would like to create, and Nesstar will create a chart. In this example, we selected the vertical bar chart for a single variable. 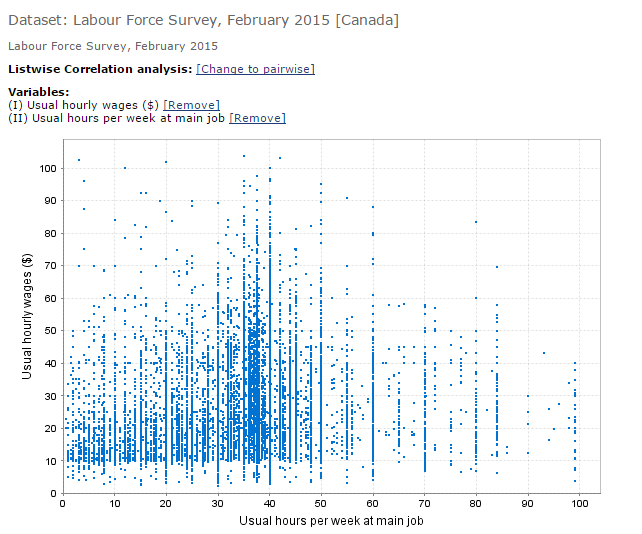 For correlation and regression, you can create scatter plots to visualize your data. To create a scatter plot, create your correlation or regression analysis by following the previous instructions. Then, click the “Scatterplot” icon in the upper right corner, and Nesstar will create your scatter plot. To find out more, see Nesstar’s Graphics page.